The formally recognized wetlands make up a relatively small proportion of the Sandy Lake watershed, about 3.5% according to the AECOM 2014 report, which also notes that “this is a small proportion relative to the size of the watershed and suggest the watershed is well drained”. 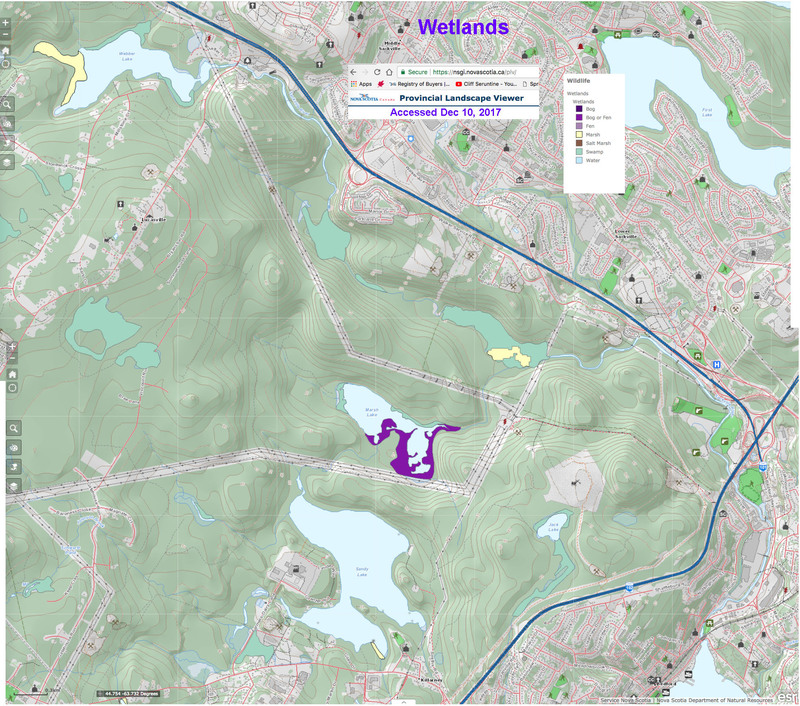 However, the AECON map (Fig 3 in AECOM 2014), which appears to be based on the wetland layer in DNR maps, does not include wetland at the fringes of Sandy Lake, along much of the watercourse of Peverill’s Brook, Bob’s (Johnsons) Brook, and Northwest Brook. 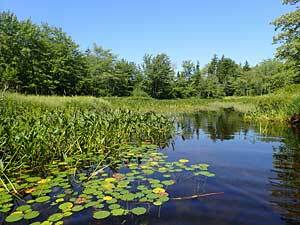 These fringing wetlands play very important roles in the watershed. Nor do the AECOM and DNR maps include patches of treed wetland, some of which in the Jack Lake lands are quite large. released into a lakeside wetland. The wetlands play critical roles in filtering out nutrients, silt and organic debris coming in via streams and as habitat for wildlife. I observed a greater abundance of bullfrogs and green frogs and their tadpoles in the fringing wetlands on Sandy Lake and on the watercourse down to Marsh Lake (likely through to the Sackville River) than I have seen anywhere in Nova Scotia. Wood frogs are common in vernal pools in the forests. I was told by a lakeside resident that leopard frogs were much more abundant and bull frogs less abundant in the past. 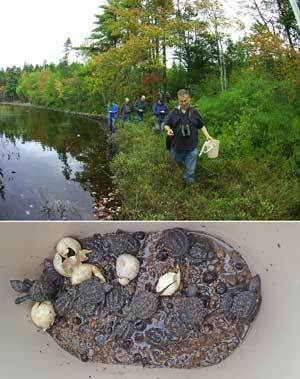 Snapping turtles are found on Sandy Lake, and wood turtles (listed as “threatened” in NS have also been been reported. According to Clarence Stevens of the local Turtle Watch group (and a well known Halifax area naturalist), snapping turtles were once present in 25 Dartmouth area lakes, today only in three. Snapping turtles were added to our Species-at-risk in 2013, where they are listed as “vulnerable”.